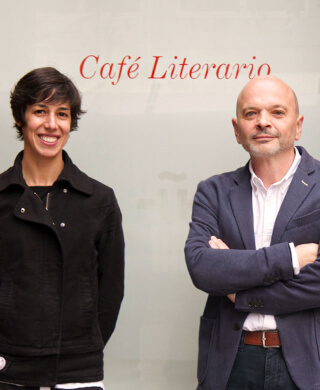 Today we’re meeting Victor Andresco and Laura Martín, director and cultural officer respectively at the Dublin branch of the Instituto Cervantes, the international Spanish language and cultural organisation. Dublin is a place that is somehow familiar to the Spanish, Victor reckons. It’s not exotic or strange, he says – and he means that in a good way. Spanish people often send their children here to learn English, he points out. His Dublin taxi driver might very well own a holiday home in Spain. And there are other links, too. “We Spaniards feel very close to you”, he says, “since Juan del Águila arrived in 1601 in Kinsale with his soldiers to help the Irish against the British”. From military history, we move quickly onto languages. Of course, it’s not really fair to ask the director of a language institute to compare other languages to their own. But, hey, let’s do it anyway. “Spanish”, we ask Victor “is the most wonderful language to learn, isn’t that right?”. “Every language is wonderful”, he says, as he has to. But seriously, what’s the sales pitch for Spanish, these days – vis-a-vis German, for instance? “Well, we have things that Germans don’t have and that they envy, I suppose,” says Victor. We have a natural door to Latin America, to the whole of America, because more than 200,000,000 people there speak Spanish. You can use Spanish in 22 countries, plus the US. It’s easy to use your Spanish, too”, he continues. “So say you learn the standard Spanish we teach here and you go to Spain. If you go to Salamanca where Laura’s family is from, you are happy. Sure, if you go to other places in Spain or in Latin America, you maybe need some adaptation. But if you go to Donegal with your standard English, the same is true. We do not have so many dialects as they do in Italy for instance”. Fair enough, Victor. But in Spain, you also have Basque and Catalan. “And Galician”, adds Laura. Does the growth of interest in minority languages like these – and in Irish too – mean that mega-languages like Spanish are under attack? Not a bit of it, apparently. 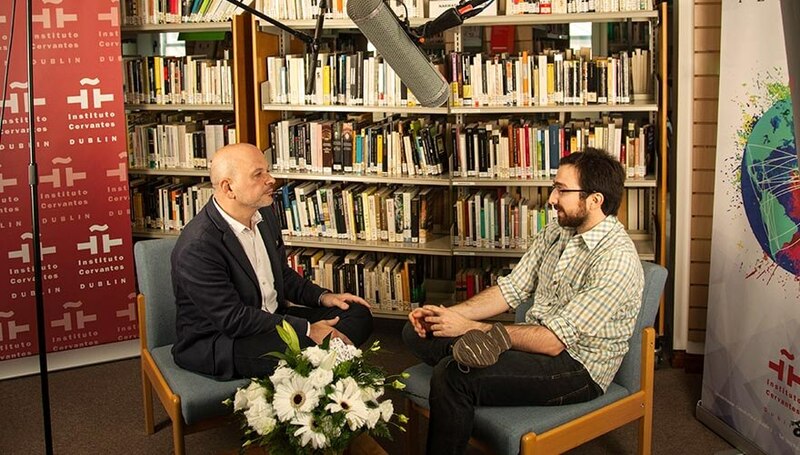 In comparison to the Alliance Francaise and Germany’s Goethe, the Instituto Cervantes is a young organisation and distinctly post-Franco in character. In fact, it’s actually part of its remit to facilitate the learning of Basque, Catalan and Galician as well as Spanish. (As it happens, there are rarely enough takers in Dublin for a course in Catalan. At the Moscow Instituto however, Catalan is all the rage). Victor reports that the Dublin Instituto is especially active in the cultural sphere. Laura and her team are responsible for a richly diverse programme of events, encompassing everything from chess in Spanish (for kids) to the films of Christopher Nolan (with reference to the work of Borges) to Flamenco classes and art exhibitions. We ask Laura and Victor if they would care to mention any particular examples of Spanish cultural output they’d like to bring to the attention of the Dublin.ie reader. “Station to station”, by Alé Mercado. Victor, with the diplomacy proper to his office, says that he is keenly aware that we’re sitting right across the road from Samuel Beckett’s alma mater, Trinity College, and just a few metres from Sweny’s chemist, purveyor of lemon soap to Joyceans the world over. So literary-wise, we’re looking for some heavy hitters here. Federico García Lorca is mentioned, the Columbian Gabriel García Márquez too. Laura comes up with a couple of names from the visual arts, notably Isidro Ferrer and Alé Mercado – an artist and illustrator who’s lived in Ireland for 15 or so years and whose dashing work graces this page, as it does the walls of homes and galleries around the country. But hold on a second, what about Cervantes, for whom the Instituto is named? Is his spirit still alive? Laura says that a recent party of Irish school children were pretty clueless about the great writer whose main character gave us the word ‘quixotic’. But on the other hand, she says points out there is a quote from Don Quixote on the wall of The Fumbally café on Clanbrassil Street: “All sorrows are less with bread”. Victor Andresco and Laura Martín. Victor’s English is not perfect. But it shows great promise. He resorts to a word you’d rarely hear on Dublin’s streets – ‘immanence’, (def: existing, operating, or remaining within; inherent) – to expand on this idea. “Yes, Quixote is immanent in Dublin”, he reckons. As a new arrival in the city – he’d been here six weeks when Dublin.ie talked to him – he mentions the kindness and support he’s received from Dubliners he’s only just met: “They don’t expect anything from me. They don’t know where I work. I used to tell them I play piano in a nightclub to avoid questions! They help you like Don Quixote helped people. I feel they really believe in love.”. Laura agrees: “They care about people”, she says. From a literary point of view, Victor also finds parallels between the great Spanish book and a great Irish one. “There are, in my humble opinion”, he says, “many similarities between Cervantes and Joyce since Don Quixote and Ulysses are both huge catalogues of jokes. Of course, love is the main argument, but both have this common trait of mixing love and humour”. Yes, well a reference to Ulysses is sure to go down well with Dublin.ie; if Laura’s and Victor’s colleagues at the Instituto are half as charming as these two, the learning of Spanish there is likely to be a great pleasure. 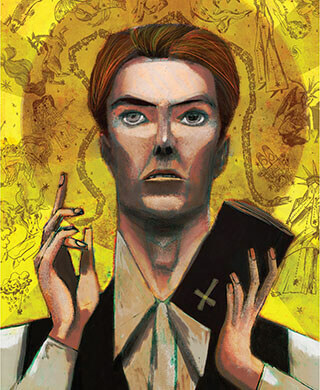 Header image; Hippocampus, and David Bowie portrait; Station to station, by Alé Mercado, courtesy of the artist. The people, places and things that make Dublin special. Tucked away on Lincoln place, in the heart of Dublin’s south inner city, is Sweny’s pharmacy. It was made famous by the James Joyce novel, Ulysses. Sweny’s is no longer a working pharmacy, but a key part of Dublin’s culture and nostalgia. It’s run by volunteers to maintain its original 1850’s Victorian style – made obvious by the mahogany counter and old glass cabinets outlining the room. Shelves of unopened medicine bottles and old photographs sit in the cabinets, still waiting to be collected. The original chemists sign is still intact, proving that this place has not lost its charm!